Have you ever had one of those days where from you know, from the moment you wake up, it’s going to be a struggle? I know, I know, it’s all a mindset and I totally agree that you are what you think about and do, but sometimes I am just plain ‘ol lazy, or tired, or both. It’s for days like these that I plan a few crockpot meals into each meal plan. I would love to say that I am able to spend an hour or two making dinner each night but most weeks I’m lucky if that happens half the time. I am very blessed though when it comes to my boys taking naps… Most days they nap together for at least an hour. Some days I get some cleaning done, most days I check my Facebook or Instagram, and every once in awhile I take a nap too (Usually I luck out on those days and they will nap together for 2 or 3 hours). 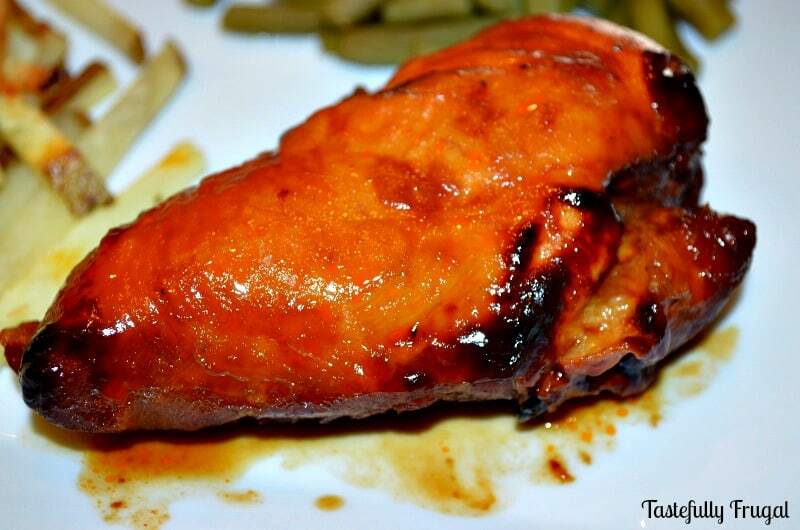 This chicken recipe is super easy to throw together and perfect for those days you know you won’t have a lot of time to prepare dinner. 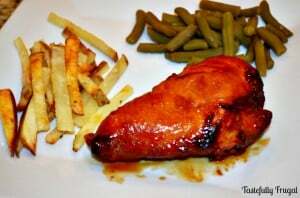 I love how moist and juicy the chicken is and my boys love the sweetness of the bbq sauce. This recipe was one that I shared in my freezer meal round-up back in July. You can easily make this ahead time as a freezer meal too. Just throw all the ingredients in a ziplock bag and lay flat in the freezer. It’s always good to label your bags with what’s in them, cooking directions and when you put them together. I’ve read a lot of posts that say it’s best to use Ziplock brand bags only for freezer meals but I’ve found that these Walmart Brand bags stand up just as well as the name brand and you get a lot more for half the price! In a bowl mix all ingredients together, except chicken. 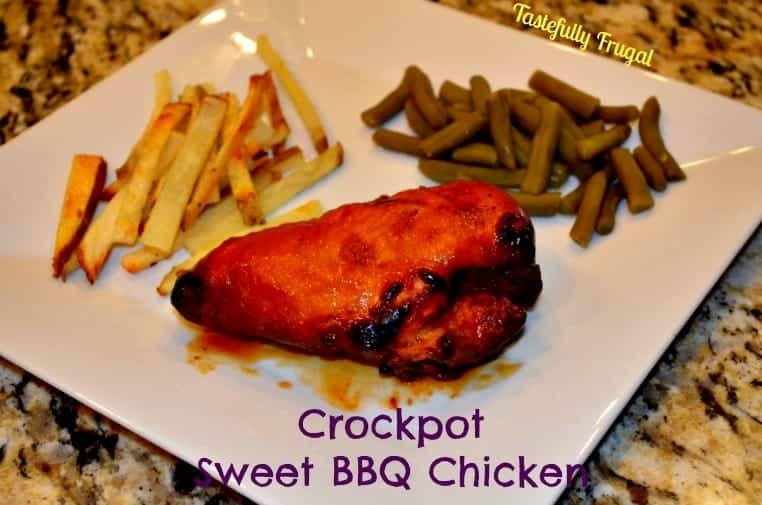 Place chicken in crockpot and pour sauce on top. Cook on low for 4-6 hours (I cooked mine for about 4 1/2 hours and they turned out perfect). I served the chicken with my Imitation Smashburger Fries and green beans. 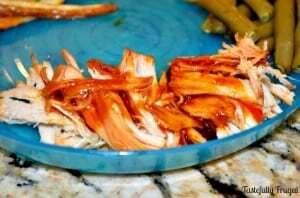 But I think it would also taste good shredded in a salad or on top of rice. We did shred it for my boys to eat and they devoured it! Do you have a favorite easy recipe you like to make on hectic, crazy days? I’d love to have you link it up (or any recipe you like) at our Tasty Tuesdays Link Party. Tammy from Creative K Kids is the host of this party every week! 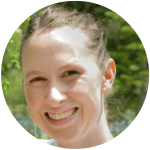 This month, Anna from Family Living on a Budget and Sydney from Tastefully Frugal are also running this party on their blogs! « Friday Pie Day… You Better Bring A Bib! Thank you so much for linking up again this week Kendra! I love the fall for slow cooker meals. Let me know what your family thinks when you make it! Hope you have a great week friend! !